Through 12/19, get up to 40% off on Men’s Armani Exchange items and free shipping on orders over $25 at Macy’s. Some exclusions apply. Check out this awesome Armani Exchange Mens Faux-Shearling Quilted Jacket that’s on sale. I know my son would love to have one like this. Even better, get $10 back on orders of $50+ or $25 back on orders of $100+. The rebate is valid on purchases made through 12/31/18. Don’t forget to enter the #LastMinuteMacys gift card giveaway to win one of 20 $50 Macy’s gift cards. Get all of the details here. Disclosure: This post is sponsored by Savings.com. Have you come to that point in your life where you find you have an extra car in your driveway, or maybe you’re getting ready to upgrade and you could use some info on selling your used car? Whatever the case may be, here are a few tips to get you started. The first thing you’ll want to do is clean your car. Inside and out. Wash it, vacuum, clean the upholstery, windows, etc. Try to get it as shiny and fresh smelling as possible. Take some great pictures of the car so that you can post it online. You’ll want to take a lot of pictures so that potential buyers can really see what they would be buying. Gather all of your important documents relating to the car such as the title and a bill of sale. You’ll also want to research the market value of your car before you try to sell it. Cars.com has a great tool available to find out how much your car is worth. The next step would be placing a for sale ad. You can post it online at Cars.com for free. Be sure to describe details about the car such as how many miles it has, if it’s automatic or stick shift, any special features it may have, etc. Don’t forget to disclose the reason you are selling it. Once you have posted your ad, be sure to share it on social media and Craigslist to get exposure to more potential viewers. Be sure to check Cars.com to learn how to complete the final steps in selling your car, such as how to set up a test drive, transfer ownership, etc. Cars.com is a great resource not only for selling but also for buying cars. They also have great info for parents on how to conduct car seat checks. Be sure to check it out. Did you know that studies over the years have shown a significant correlation between underage drinking and exposure to alcohol ads? The is also true when it comes to children’s eating habits and their exposure to junk food ads. Ads are something we are going to be exposed to. There is no way around it, but what if you could control what kind of ads you and your kids are exposed to? Not sure what I mean? Let me give you an example. If your kid is into sports and watching the game on tv, he or she will likely be exposed to ads featuring beer, condoms, or erectile dysfunction, just to name a few. Not only is that inappropriate, but it’s all sorts of awkward. What if you could automatically stop those ads from coming through and have something more appropriate shown for free? Would you do it? So how does one control said ads, you ask? Using a new and patented technology, Filtrie is premiering an, opt-in system that lets you set limits on TV ads, which is anticipated to be available by the end of this year. This will be a free service. To get started you would need to fill in some info so they can determine what is relevant to you and what is appropriate or not appropriate for you and your family. You won’t even need to sign in since they’ve designed this service to run in the background. Filtrie will work across all content sources such as cable, satellite, DVR, etc. You can switch between or have multiple services. It’s really up to you, how you choose to use it. Filtrie will have two settings, global and selective. The global filtering will allow you to replace all unwanted ads, no matter who is watching. The selective filtering feature allows you to choose which ads are displayed based on who is watching. They can actually use your phone’s proximity to the TV to determine which ads to replace or show based on your profile. Filtrie will use real-time data drawn from the consumers who sign up for Filtrie, which allows Filtrie and its customers to know who is watching TV, what they’re watching, and for exactly how long. Advertisers can spot target their ads to the precise viewer who is present. If you opt in, you will be able to replace unwanted ads (no matter who’s watching) or you can allow Filtrie to automatically show or replace TV ads based on who is in the room. 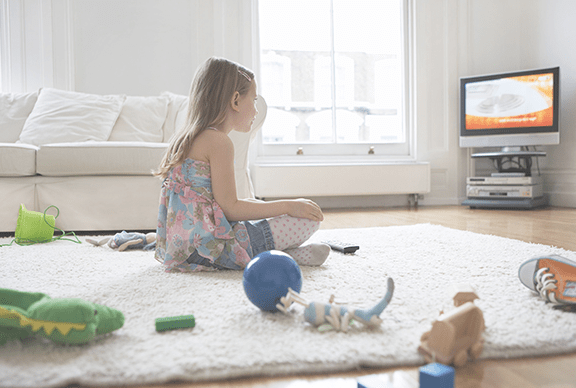 As one of its many benefits, the service will allow parents, for the first time, to protect their children by having offensive or certain TV ads replaced with more appropriate material. This means underage children would no longer be exposed to TV ads for adult products such as beer, wine, lingerie, condoms, etc. Sounds good, right? To learn more about Filtrie, click here. Disclosure: This a sponsored post. All opinions stated are my own. 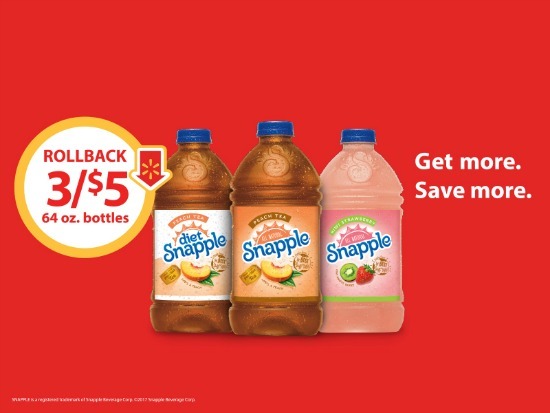 If you love Snapple, you are in luck! I have a special deal to share with you. Visit http://cbi.as/4ms6q to see the amazing Kashi® GOLEAN™ Plant Powered Shake and Kashi® Organic Super Blend varieties available on Target.com. 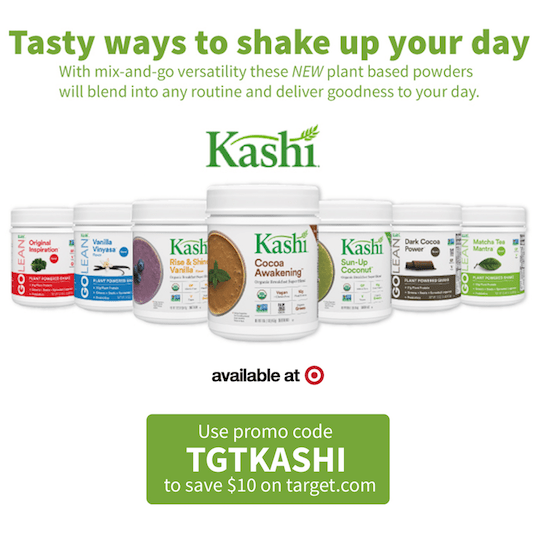 Use promo code TGTKASHI at checkout to receive $10 off your purchase of any one of the products!